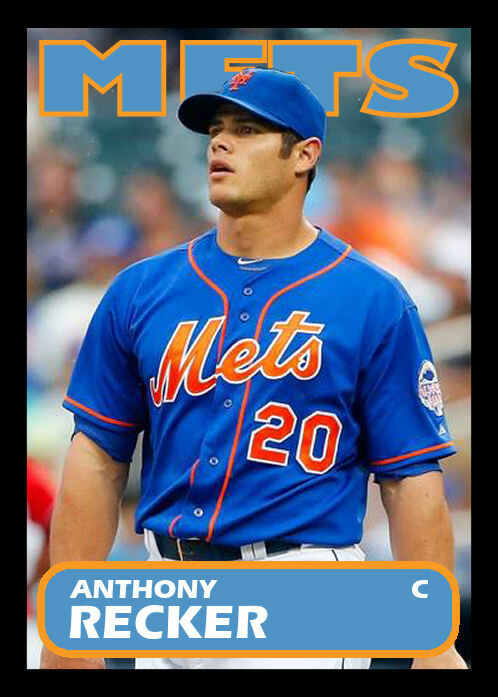 Anthony Recker, for no particular reason. I’m doing the sportswriter-mailing-it-in impression today and writing a post of snippets about unrelated sports things. It has been an exhausting week. Must read: this graphic essay on The Toast about why sports are awesome. Will be particularly enjoyable for our sizeable hockey fan contingent. Also must read: our own Nicole’s article about the WWII Girls Baseball Living History League, which she recently joined. I am really, really bad at playing baseball, but if there was a New York branch of this I’d endure the humiliation of being unable to catch or hit (I can throw semi-okay) to participate. Somewhat related to baseball history: Baseball Nation’s been photoshopping photos of new-ish stadiums to look like retro postcards. They did Busch III today, but I think my favorite so far is Citizens Bank Park. NYC (along with I think, LA and Dallas?) Time Warner customers are currently enduring a standoff between TW and CBS. CBS is trying to push their luck with ads pointing out that TW customers will be unable to watch the PGA Championship this weekend or their preseason football coverage. Unfortunately for them, it’s hard to threaten “no NFL” coverage when LA has no team and the NYC team in question is the Jets. Also, I refuse to watch pro football before Labor Day, as it is prime baseball season. The Cards haven’t had an off day in almost three weeks and I have at least checked in on every single game (which of course means they started losing a bunch). My boyfriend is streaming the Saints game right now and I’m pointedly not looking at the TV. Related: this might be why I’m usually not prepared for the fantasy football draft. Peanuts and The Simpsons: both good at baseball math. I appreciate this, as I love both of these cultural whatevers, and the improbability of the football scenes in Friday Night Lights still distracts me from the overall awesomeness of the show. Some of you know that I’ve been basically teaching my boyfriend to love baseball during the course of our relationship (for four years as of this weekend – Happy Anniversary, babe!). 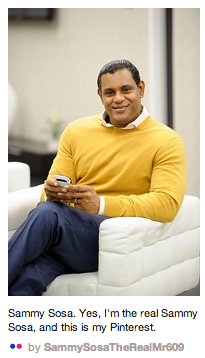 This week, while watching the Dodgers-Cards series, the instant Jerry Hairston came up to bat, he immediately identified him as “that guy I hate.” While with the Brewers, Jerry’s habit of stepping out of the box after every pitch drew particular ire from my boyfriend (and he saw it a lot, as this occurred during one of the seasons where the Brewers and Cards slugged it out for the division title and then played a playoff series). However, I believe this is the first recorded instance of my boyfriend recognizing a player who was not formerly with St. Louis or New York after he changed teams, without some prompting on my part. Poor Jerry. So I know there are apps and other ways to handle “clipping” things from Twitter and your mobile phone, but when I am scrolling through and see a link that intrigues me, I just email myself the tweet. There’s no need to remember to check another app or anything like that – I’m in my inbox a hundred times a day. It’s a little old-school and probably a little silly, but it’s my comfort zone and I’m owning it. This ESPN piece trying to understand Italian soccer, hooligans and racism is just beautifully written. The subject matter is baffling, but this is a read that’s totally worth your time. Long form journalism at it’s finest. Carlos Gomez is having a heck of a year and he’s played enough places that I think you’ll find this interesting: if you hit a ball to center field in Miller Park, the odds are not in your favor that you’ll actually get a hit. According to ESPN.com, of 35 balls hit to straightaway CF, just one of them resulted in a hit. Carlos Gomez has caught 97% of those balls. The major league average is 78%. But you already knew Gomez was a plus (plus) defender. This year (and the end of last season) he has also figured out how to hit for power. Turns out, his coaches just didn’t know how to harness all his skills before and were pigeonholing him as a ground-ball hitting speedster. If you didn’t read this amazing profile of Britney Griner, you should. Great insight into a ground-breaking woman. I don’t watch basketball, but she will always get a hearty “you go girl” from me . Deadspin ran this excerpt which tells the tale of meeting and hanging out with Muhammed Ali, which on it’s own is just stupendously cool. But then it led to commentors telling stories of randomly meeting with Ali and then I had many warm fuzzies. That was my first intro to The Stacks at Deadspin. Talk about a rabbit hole. Do yourself a favor and go for a scroll. So much good reading. Former Badger Hockey player Hilary Knight is probably my all-time favorite. Hard to explain, but I’m still heart-broken she never won the Patty Kaz, especially because her taking time off to play for the US in the 2010 Olympics likely had something to do with that. In those same Olympics it was said she likely has the best shot in the game – she was a Junior in college at the time. Anyway, she plays in the Canadian Women’s Hockey League and won their inaugural season MVP. Here’s an interview with her. There’s a gorgeous old hotel in Downtown Milwaukee that most visiting sports teams stay at. It’s supposedly haunted. The stories are apparently varied and widespread enough that ESPN the Mag did a story about it. Read all about the Pfister. I’m a Twitter fiend. I’ll admit it. Yet there is only one account I check in on multiple times daily to make sure I haven’t missed anything – @DUPorterhouse. Porterhouse is the live bulldog mascot of Drake University in Iowa. He’s a rescued bulldog, winner of the Most Beautiful Bulldog Contest at Drake and very, very photogenic. He’s also an advocate to help end puppy mills bc his native state of Iowa has so many of them. His mom started him a Twitter account and well, she’s just really good at it. There are tons of adorable pictures and cuteness and Porterhouse consistently makes my day better. He goes to their basketball games and leads them onto the court by chasing the ball. He’s just great. Seriously, though – here’s a pic of him in Shrek Underoos. Tell me that doesn’t make the whole world better. If you’re a Mad Men watcher and haven’t watched Sunday’s episode, this piece contains spoilers, so be warned. But even if you don’t watch Mad Men, this is a spectacular piece from Tom and Lorenzo that gives a very detailed and interesting cultural look at what it was to be a gay man in 1968. I got home tonight to discover my Internet has gone on the fritz. Luckily I got a smartphone a couple months ago and can continue blogging away on this little computer I carry around in my purse. Technology is amazing. But also, I’m totally blaming any weird formatting issues on it. Join me after the jump for what the hell is up with that picture and more juicy internet goodness. I’ve been back from my vacation in New Orleans* for about 48 hours now, and I’m not entirely adjusted, so please enjoy these links. Somehow they are all about baseball, but that wasn’t intentional. *The picture above was taken on my vacation. 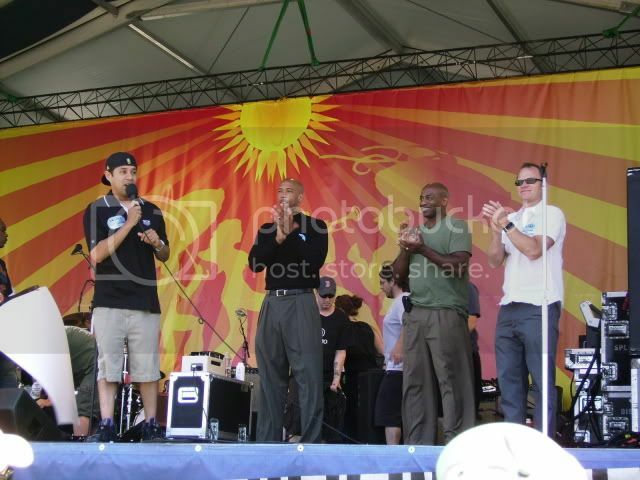 That’s New Orleans Hornets coach Monty Williams 2nd from left, with the GM and President of the franchise, appearing at Jazzfest. I was a little disappointed that no players appeared with them, but Monty Williams is quite nice looking in person. 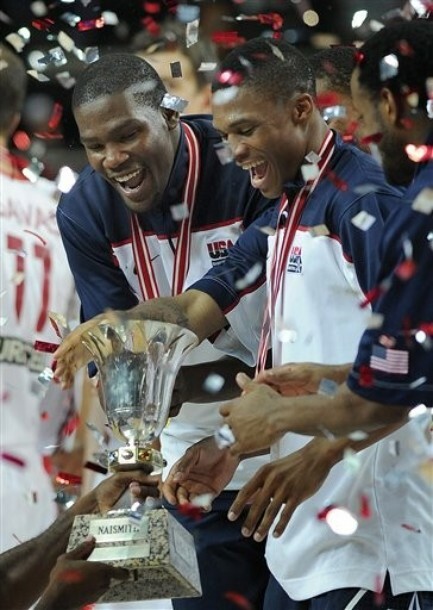 First off, let’s congratulate Kevin Durant and the rest of the US team on winning the World Basketball Championship, the country’s first since 1994. If Kevin Durant smiling doesn’t make you smile, check your pulse.